The effect of additions of niobium in an amount of from 20 to 35 wt.% on the structure and properties of two-component Ti – Nb alloys is studied in cast condition and after a homogenizing annealing. The structure of the alloys is determined by optical and scanning electron microscopy, x-ray spectrum analysis and diffraction of synchrotron radiation. The lattice parameters of the formed phases and the mechanical properties of the alloys are assessed. Translated from Metallovedenie i Termicheskaya Obrabotka Metallov, No. 10, pp. 44 – 51, October, 2018. The work has been performed with financial support of the Novosibirsk State Technical University (Project No. S-3.2018) using the equipment of Collective Use Center (TsKP SSM) of the Novosibirsk State Technical University. M. Sumita, T. Hanawa, and S. H. Teoh, “Development of nitrogen-containing nickel-free austenitic stainless steels for metallic biomaterials – review,” Mater. Sci. Eng. C, 24(6 – 8), 753 – 760 (2004), doi: https://doi.org/10.1016/j.msec.2004.08.030. M. Niinomi and M. Nakai, “Titanium-based biomaterials for preventing stress shielding between implant devices and bone,” Int. J. Biomater., 2011, 836587 (2011), doi: https://doi.org/10.1155/2011/836587. M. Niinomi, “Mechanical properties of biomedical titanium alloys,” Mater. Sci. Eng. A, 243(1 – 2), 231 – 236 (1998), doi: https://doi.org/10.1016/S0921-5093(97)00806-X. 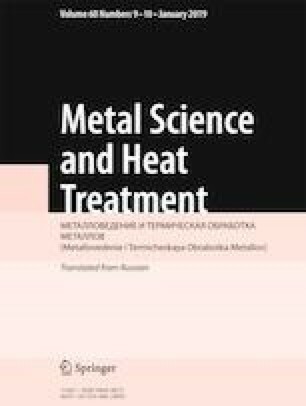 N. V. D’yakonova, I. V. Lyasotskii and Y. L. Rodionov, “Orthorhombic martensite and the ω phase in quenched and deformed titanium alloys with 20 – 24 at.% Nb,” Russian Metallurgy (Metally), 2007(1), 51 – 58 (2007), doi: https://doi.org/10.1134/S0036029507010107. S. Cai, J. E. Schaffer, and Y. Ren, “Deformation of a Ti – Nb alloy containing α″-martensite and omega phases,” Appl. Phys. Lett., 106(13), 131907 (2015), Iss. 13. P. 131907, doi: https://doi.org/10.1063/1.4916960.